The time has changed, it’s officially winter and it’s cold, cold, cold which means time to batten the hatches, light the fires, lie back and watch movie’s, hurray! I still remember the first time I watched this with Mum and I’ve loved it ever since. Fast paced action, sensational songs and the powerhouse voice of Howard Keel as Adam. Add the unlikely premise for a musical (the kidnapping of six towns girls by six lonely bachelor brothers!) 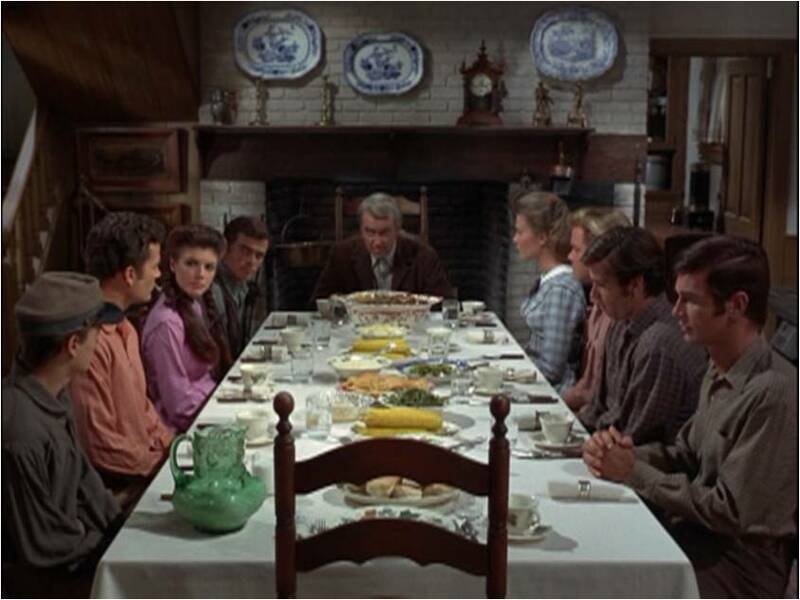 choreography which makes dance numbers out of things like chopping wood and raising barns, wrap it all up in glorious technicolour and you have my number ten movie ‘Seven Brides for Seven Brothers‘. 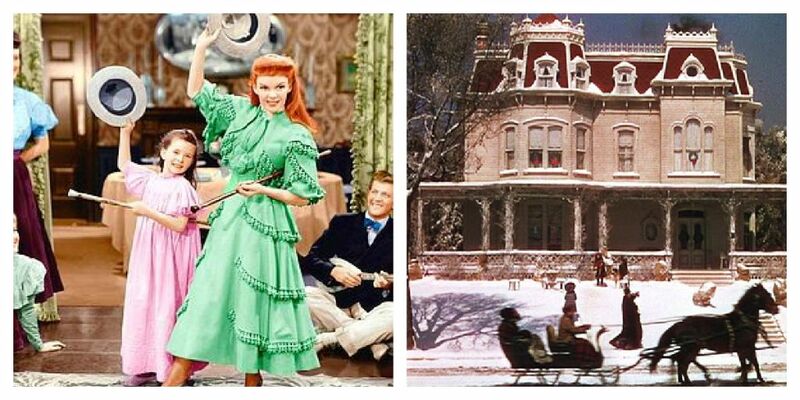 Sweet nostalgia, lovable characters, stunning songs, turning seasons and sumptious details, from the costumes to the beautiful home, all combine to make this one of the most popular movie’s of World War II and it’s easy to see why. 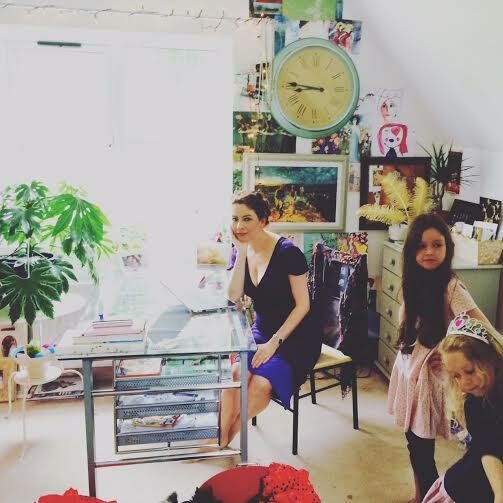 Amidst the feel good atmosphere and happy family life is a pervading sense of change and loss. By the time Judy Garland sings ‘Have Yourself a Merry Little Christmas’ I’m guaranteed to have a lump in my throat and a tear in my eye but then smiling through tears is a lovely emotion! Long before it would feature on any list of mine other than one called ‘movie’s dad loves’ or ‘movie’s that are always on at Christmas’! The Great Escape would sit on the corner of my mind, images of fences and guards, of a little Scots guy called Yves making his desperate bid for freedom, of digging and tunnelling and secrecy, of desperate discovery and most of all Steve McQueen. In a stellar cast of cool tough guys there was none cooler. Even though he only featured in about a third of the movie it’s always him that comes to mind, now that’s star power! Based on an incredible true story if you buy the DVD the additional feature documentaries about the real men will completely blow you away. A stunning example of what people can achieve even against all odds. Discovering the movie as an adult was a joy. Every story line is brilliant, every character shines. 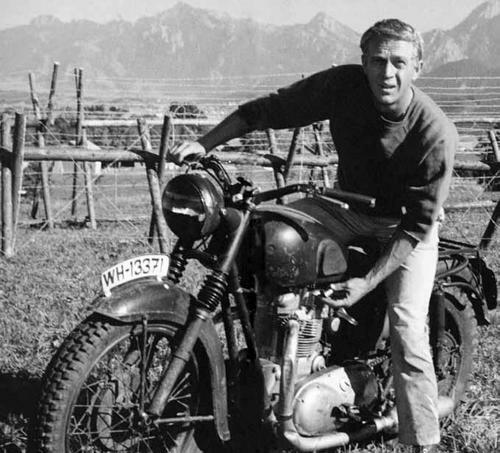 The Great Escape holds classic status with good reason. The phrase ‘they don’t make them like they used to’ comes to mind. I never get tired of this movie and it’s really difficult to explain its appeal as not a lot really happens, not on the surface at least! An epic romance, brilliantly written, directed and breathtakingly filmed on location, the scenery, the colours and even the sounds really get under your skin. I love the contrasts of colonial civilisation, white tablecloths and the good china for a picnic, set against the wilderness. One of my favourite lines is when Meryl says ‘every time I turn my back it wants to go wild again’ Robert replies, ‘and it will.’ This is also what my own garden does, Leitrim too is a wilderness! Determined to solve the magic of this movie I read the book ‘Out of Africa’ by Baroness Blixen and even though I enjoyed it I love the movie more and realise that Meryl and Robert are the magic. 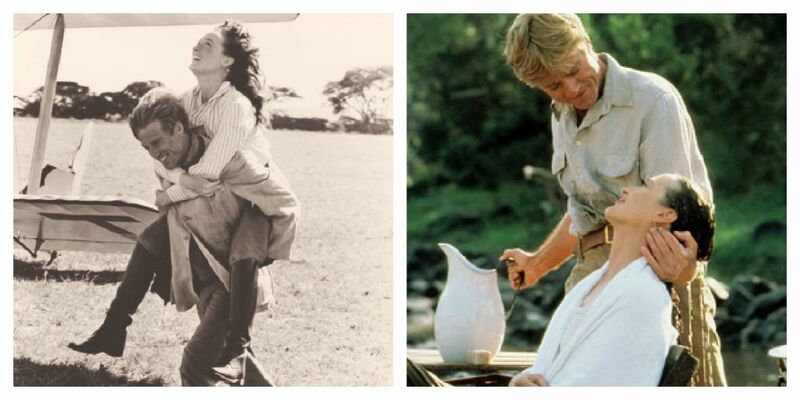 Out of Africa is powerful because it is so quietly confident, brim full with complex humanity delivered in flawless style through the star power and mesmerising chemistry of the two leads. I’m not usually a fan of Robert Redford but in this movie I find he has a kind of subtle mystery that really draws you in while Meryl is considered to be at her very best (says it all really!). One of those movie’s you find yourself thinking about for a long time after it ends. Of all the movie’s on my list this is probably the most timeless and like most timeless tales the story is a simple one. The west is settling down and the gunfighters are fast becoming relics of the time when Chris (Yul Brynner) takes a contract of protection for a small farming village and sets out to recruit a team for the job and oh my what a team that was! 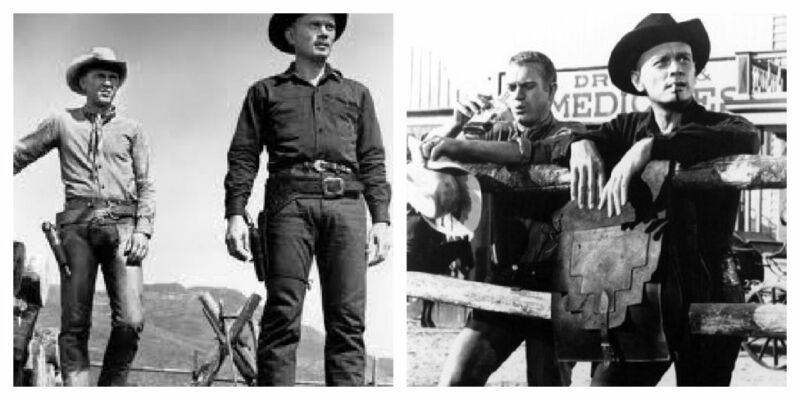 One of the things I love with this movie is to study Brynner and McQueen (yes I am a movie nut!) two fascinating stars of their day. Steve is the ultimate cool guy, cheeky; laid back and down to earth while Yul with his great face, penetrating stare and commanding voice is an enigmatic leader and boy could he deliver a line! The seven were a literal dream team of already famous or on the verge of fame actors, strong enough to carry the movie by these virtues alone but thank god this is an old movie and so we have a great script! Hallelujah! 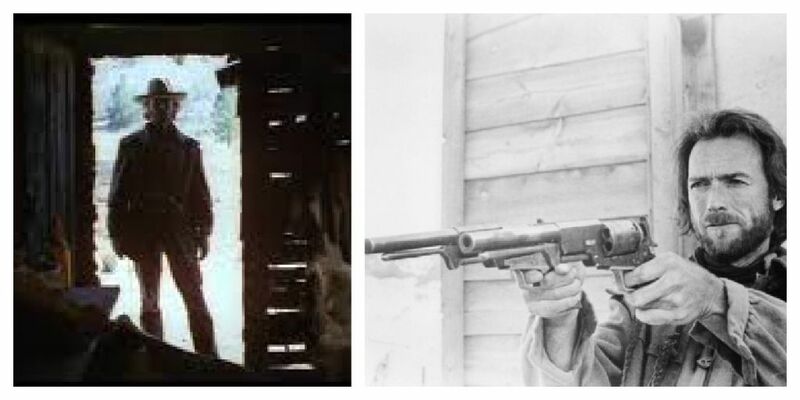 Every character starts out as if casually heading for a gunfight but along the way becomes a fully developed character who gets to show their true heart with great lines, wry wit and moral pathos that makes the end of the movie so compelling as you watch each character embrace their fate of survival or death. I love James Stewart so much I can hardly tell you but the passion of the man is quite simply spellbinding. Yes, this is another western but very different in style from your normal run of mill fare. For one thing it’s about a family, the father, Charlie Andersen is trying to keep his grown children out of the civil war on the grounds that they’ve never kept slaves and have never asked the state for anything but of course the boys have different ideas and want to sign up. When the youngest son is mistaken for a soldier and taken prisoner Charlie and his sons set out to find him, leaving no stone unturned in a country savaged by war. Clint Eastwood is another favourite actor of mine, I love this man! ‘The Outlaw Josey Wales’ is my favourite of all his movie’s and between myself and my brother Colm we can pretty much recite the whole thing from start to close! The critics may not agree but Clint himself considers Josey Wales equal to ‘Unforgiven’ and so do I. Firstly the atmosphere and cinematography are second to none then Clint as Wales… the hunted man, the loner who has lost everything begins to heal through virtue of a stellar cast of great characters that he accumulates on his travels. He turns again towards the possibility of peace and a normal life but increasing notoriety and growing legend make it virtually impossible. The Outlaw Josey Wales is full to the brim with great movie lines and wisdom plus an impossibly cool leading man. There is a moment when the boy is dying, he tells Josey that he isn’t afraid anymore and Josey smiles at him, for me that is the golden moment perhaps better explained by Life magazine that had this to say about Clint. In short Singing in the Rain is a hilarious, irreverent movie, choc full of mind blowing skill, talent and a glorious feast for the senses. You simply cannot watch this movie without a smile on your face or an appreciation for the talent in front of your eyes. 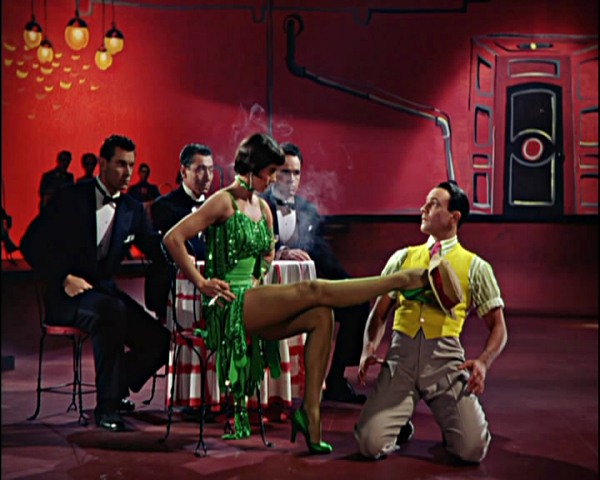 The female lead Debbie Reynolds who suffered bleeding feet and was famously discovered hiding in tears under a piano by Fred Astaire who offered to help her with her routines later compared the pain of living up to Gene Kelly’s exacting requirements and schedules to childbirth. ‘Donald O’Connor had to be hospitalised following his incredible ‘make em laugh’ routine and if you’ve seen it you won’t wonder! 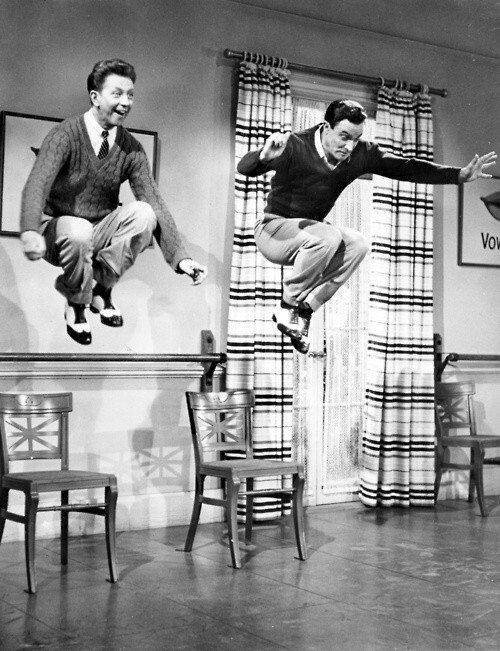 Incidentally the two male leads, Gene Kelly and Donald O’Connor were of Irish descent and Singing in the Rain is rated by the American Film Institute not only as the greatest musical ever made but as the fifth greatest movie ever made. It’s my James again and this time he means business. 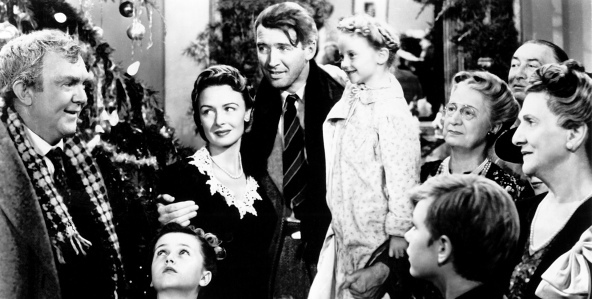 It’s a Wonderful Life was his first movie following five years service as an American Air Force Pilot in the Second World War and watching it I’m reminded of an interview with his daughter who said that after the war he was a changed man. She said she could never watch this movie without crying as she felt he left all his feeling and experience of the war in the role of George Bailey. Such a simple tale, a man who has long considered himself a failure and falling on hard times decides that everyone would be better off if he had never been born. Contemplating suicide on Christmas Eve the angel Clarence comes to show him just what that world would be like. In reality that is just an aside because the glittering star of this movie is James Stewart widely considered one of the greatest actors who ever lived he somehow manages to deliver the penultimate sentimental role without a dash of schmaltz, he just makes it work. Masterful. 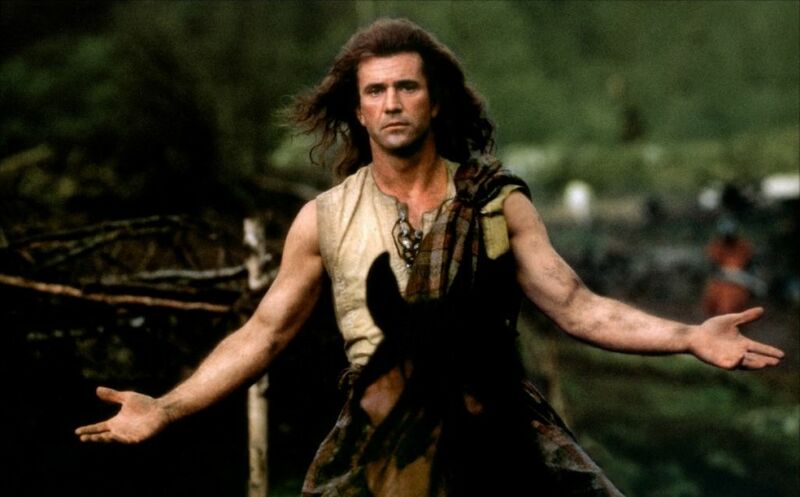 Why do we all love Braveheart so much? I could be wrong but I’m betting of all the movie’s here it’s the one on everyone’s list. Let’s look at the facts, heart stopping action, you barely notice three hours pass by. 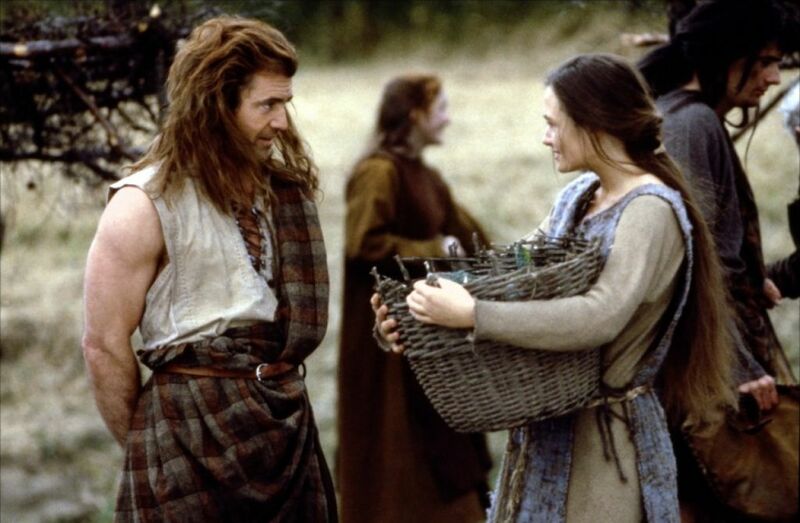 A romance that feels real, perfect yet relatable, brutal action but not gratuitous, the age old appeal of good trumping evil and then Mel… Watching Braveheart you can’t help but ponder the wasteland that was the Lethal Weapon movies, talk about hiding your light under a bushel and what a light it is! The charisma, the believability of the man is astonishing. Hamilton: (in Latin) He is a bloody murdering savage. And he’s telling lies. William: (in Latin) I never lie. But I am a savage. (in French) Or in French if you prefer. (in English) You ask your king to his face, ask him, and see if his eyes can convince you of the truth. Robert the Bruce: I don’t wanna lose heart. I wanna believe as he does. Oh Jane. You are a part of me I’ve misplaced. And your movie synopses(?) are fabulous. I once was known as “that video girl” all over Baltimore as I worked in a Blockbuster store (and had a degree in film). I have lost touch with her. And I am so impressed at your movie selection. I have never really contemplated my favorites and now it seems I must. Or at least revisit some of these. And the snow falling effect up top is awesome! I know what you mean but while those exact movies you mention would feature if I were to extend the list into a top twenty I stand by my selection as purely my favourites! I actually found it really easy as I know these are my favourites, time doesn’t really come into it, it’s just what I love : ) I couldn’t put those you mention above what I have here even though I love them too!